Entering the gates, the sweeping tree-lined driveway leads to an elegant Georgian Manor House dating from the 18th Century on a 38-acre estate. The Manor House boasts original Georgian features, it is a luxurious retreat and relaxing space for your bridal party and family. Tastefully decorated to compliment original Georgian features, the house comprises 8-bedroom suites, dining room, drawing room, Gun room bar family, library and billiard room. The romantic bridal suite with four poster bed, luxurious bathroom and two large sash windows overlooking the gardens is picture-book perfect. Two stunning locations to host your ceremony for you to choose from. The Secret Garden is a hidden gem, surrounded by forestry and full of colour. 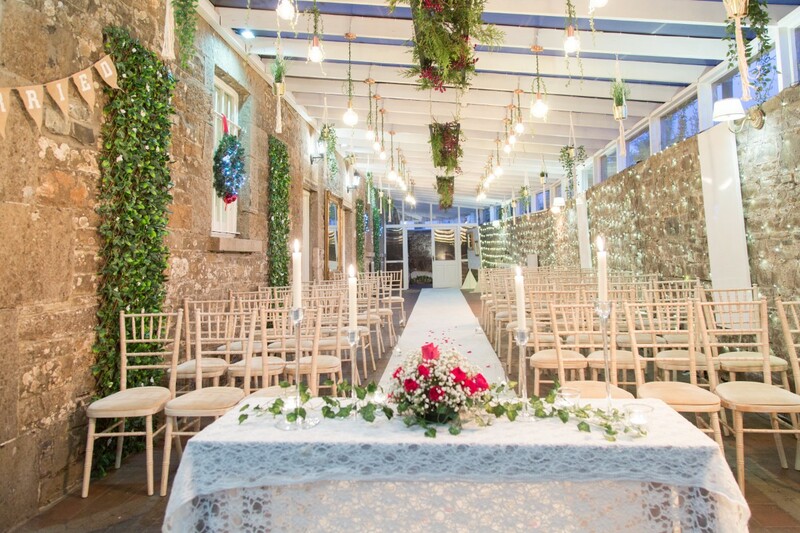 The Conservatory, imagine walking down a white carpeted aisle, surrounded by natural grey stone wall, fairy lights and most importantly all your family and friends waiting for you. Adjoining the Manor House by a ‘secret’ tunnel, The Blushing Groom Bar has the rustic charm and character of a traditional Irish Country bar. The Boyne View Suite can seat up to 180 guests and we price ourselves in ensuring our food is restaurant style, let you guests experience a true restaurant experience for your wedding. The grounds of the estate are truly spectacular extending to 38 acres of beautiful gardens and natural parklands. A central feature is the ‘Secret Garden’ - a Victorian walled garden complete with waterfall, bridge and orchard. Exclusively yours and only 35 minutes from Dublin! The perfect setting for the wedding day of your dreams. Imagine entering the gates to a sweeping tree-lined driveway leading to an elegant manor house and spectacular grounds – and it’s yours exclusively to celebrate your special day with family and friends. We know how special your wedding day is and we go the extra mile to make it extra special. Our dedicated wedding co-ordinators and hospitality team are here to take care of your every need and guide you every step of the way. Every wedding is completely unique. Boyne Hill House is yours to create a wedding day that reflects your personality, style and taste. Much more than a stunning wedding venue, we help create a truly memorable experience you will cherish forever. The beauty and character of Boyne Hill House can only really be appreciated by visiting in person. So, why not make an appointment today - we’d love to see you. Contact our wedding team today and we can begin to create your dream wedding package. Boyne Hill House Estate is a exclusive country wedding location in the beautiful Boyne Valley in Co.Meath servicing weddings throughout the local area including Trim,Navan,Dublin, Kells, Ashbourne, Dunshaughlin and throughout Ireland. Boyne Hill House Estate is a popular & desirable private Country House wedding venue steeped in history that has been part of the wedding industry since 2011 specialising in bespoke, winter or outdoor private weddings in Ireland. Cannot recommend Boyne Hill enough!! From the day we went to view it to the morning after the wed?ing we had nothing but 5* service & treatment. From Caroline, Leone, Elaine, Catherine & every other employee, they couldn't do enough for us. The food was just amazing, people are still talking about it. Its just the best place in the world, would love to do it all again! Caroline and her team were absolutely brilliant!! 5* service from the first day we spoke with them. Couldn't do enough for us!! Outstanding team!! I can't recommend them enough! Absolutely loved my experience from day one , the staff went above and beyond with any concern we may had leading up to the day. Leone was a pleasure to work with and very talented at her job. The only down fall we did experience was our dj was told to stop playing at 1.50 am .... to us the music was a big part of the day and came as a huge shock when this happened. Our wedding at Boyne Hill House was nothing short of perfection. The attentiveness of the staff, the beautiful scenery of the estate, and the incredible tasting food all made our day special. From the onset, the staff at Boyne Hill were so helpful and responsive - everything was customizable from the menu to the itinerary itself. We’d highly recommend this venue! I cannot express how fantastic Boyne Hill Team are.There was not one member of staff that did not go above and beyond for us not only on our wedding day but on the lead up to the wedding.We also held our ceremony on site here and the venue is so intimate and unusual.Everyone felt it.I would not hesitate at all to recommend this amazing venue.Book it and the rest will fall into place,you won't regret it. Every member of staff was helpful, enthusiastic and made sure that every little thing was as we wanted it. They organised many things that we hadn't even thought needed doing and made sure that we didn't need to think about anything but enjoying ourselves on the day. Brilliant people make a brilliant venue.. leone, Elaine, myles, Caroline, Ron to name only a few. The staff even managed to shift a wine stain for mammy in law. Nothing too much trouble, made it clear from the start and they didn’t let us down. Special place made special by the crew. Wonderful venue, great setting lovely grounds. It's a shame the rooms do not reflect the same standards. A tiny room under the stairs. Slept next to a pump that turns on and off when you use the toilets or taps. A wet room which wasn't better than a common hostel and there were still visible holes in the walls with a slight damp patch in the ceiling. €20 discount wasn't good enough. Disappointing! 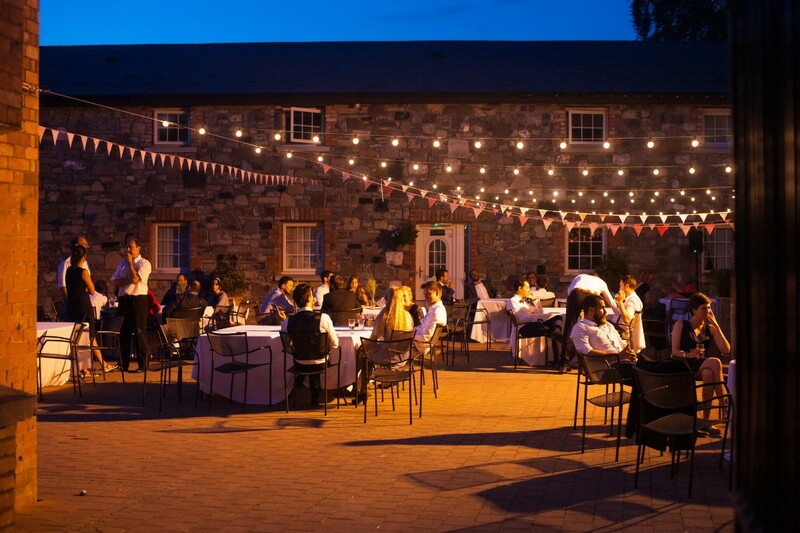 The best wedding venue in Ireland in our opinion. From the second we arrived for our first viewing we knew it was exactly what we wanted. Caroline was a joy to deal with as was every member of staff there. The food for the whole weekend was plentiful and to as high a quality we have ever seen at a wedding. Anything you needed was taken care off. Its hard to explain but you feel like part of the family, all the staff treat you like a friend almost when you are there and it can be quite emotional leaving! We just hope to God that we end up attending a wedding at Boyne Hill House! 3 months on and people are genuinely still talking about it! Best weekend of our lives and one we will never ever forget thanks to the staff and the venue. Leone & Caroline we’re fantasic, nothing was too much trouble. Venue was decorated beautifully everything as we wanted it. Got a lot of compliments from our guests and would love to do it all again. We had our wedding in Boyne Hill on NYE 2017 and it was just the most amazing weekend. The venue itself is second to none with such a rich romantic setting and gorgeous grounds. The staff are an absolute treasure, Leone, Myles, Elaine, Caroline & Catherine would do absolutely anything to help & were always a fantastic support for us, each and every member of staff were fantastic, especially the barman who was up until 6am serving us! The standard of food, the attention to detail and the friendliness made for a perfect two day event for us and all of our guests. We were all blown away by the service and the food which just kept coming, it was a perfectly relaxed, cosy venue and we would recommend it to absolutely everyone! Lovely Venue and wonderful staff. Made the day very personal and they were really flexible. Our wedding on the 29th of December 2017 was all we could ever have imagined! Boyne Hill House is an amazing venue and we are so glad we chose to have our wedding there. All the staff are so so helpful and friendly. They are so experienced and knowledgeable it instils a level of calm into you knowing they have it all looked after. All our guests are still raving about the Venue and particularly the food which out of this world. Our photographs are amazing from the Mansion House and the Gardens! If you are considering Boyne Hill House and are looking for something different to your normal Hotel venue book it! You won't regret it! We organised our wedding at very short notice and from the start the staff at Boyne Hill were highly professional and extremely accommodating. They worked with us on all elements of the package and offered a variety of ideas to suit our budget. They were in constant touch with us and took our feedback on board very quickly. On the day of the wedding all of the staff really made us feel at home and they were very responsive to our needs and the needs of our guests. The venue is superb and all of our guests in particular complimented the high quality of the meal and the service. Lovely venue inside & out, very homely, great food, relaxed environment, great little extra touches! This was our son's wedding and for once we were on the other side of the camera. 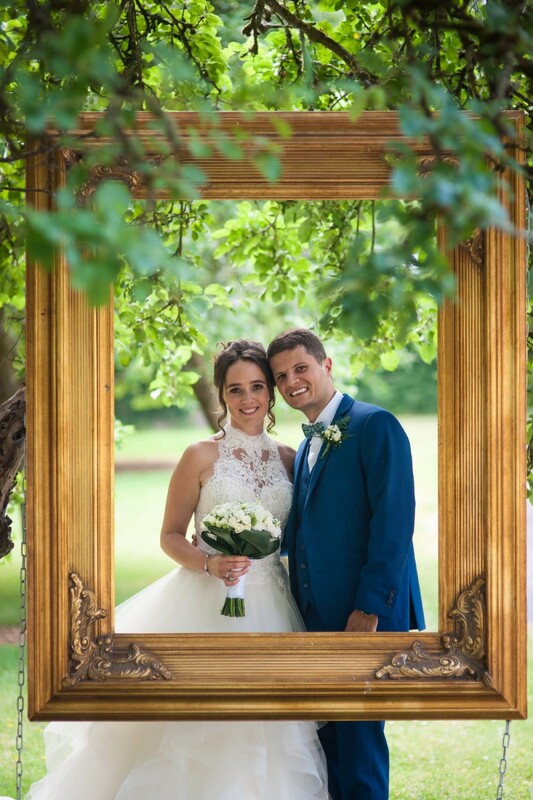 When he came to us to ask for help choosing a venue, we had no hesitation in bringing him and his fiancé Marie to BHH and they fell in love with it immediately. We were quite a small wedding party so we used the big house for the reception. The plan was to have an outdoor ceremony, but the weather dictated otherwise. It lashed rain all day but that didn't put a damper on the occasion. It just made the photographer's job a bit harder and no pressure on him either, given that 25% of the guests were full time professional photographers :-) Following the beautiful intimate civil ceremony, conducted by the lovely Romy McAuley, we retired to the drawing room, as one does, and enjoyed a few beverages. Of course the main part of the evening was the dinner and that certainly lived up to everyone's expectations. The food was superb and the service faultless. The staff in BHH are amazing and there was nothing that they wouldn't do for us. The venue is stunning, the food is fabulous and the staff are top class. Hi Denis and Lorraine , we thoroughly enjoyed creating a truly unique and intimate wedding day for your family. We are thrilled to hear from you and looking forward to seeing you no doubt very soon :) Thank you for this fabulous review ! we had our wedding four weeks ago now. by the amazing dream scapes. Martin and Antonia were an absolute pleasure to work with. There work is amazing and they made the day so easy for us. i would highly recommened dream scapes. Boyne Hill House is a stunning Estate with a lot of land and a beautiful walled garden. We picked it as we wanted a place just for us and our guests that has rooms for everyone to stay the two nights of our wedding without the hassle of looking for accommodation somewhere. On the build up to the wedding Boyne Hill House was very responsive and also asked us exactly how we envisage our day, incl. decoration, food, drinks, entertainment and agenda for the two days. We had a multi-language wedding combining two cultures and Boyne Hill House was very flexible and accommodating to make it our day, and exactly the way we wanted. On the two days we stayed there, all the staff very extremely helpful and very friendly. The food was delicious too. Everything went as planned and the whole place was also decorated the way we wanted. It was beautiful! We are still getting a lot of compliments about our wedding and Boyne Hill House played a crucial role in it. I can only recommend this venue for your wedding! Myself and my husband wanted a lot from our venue. 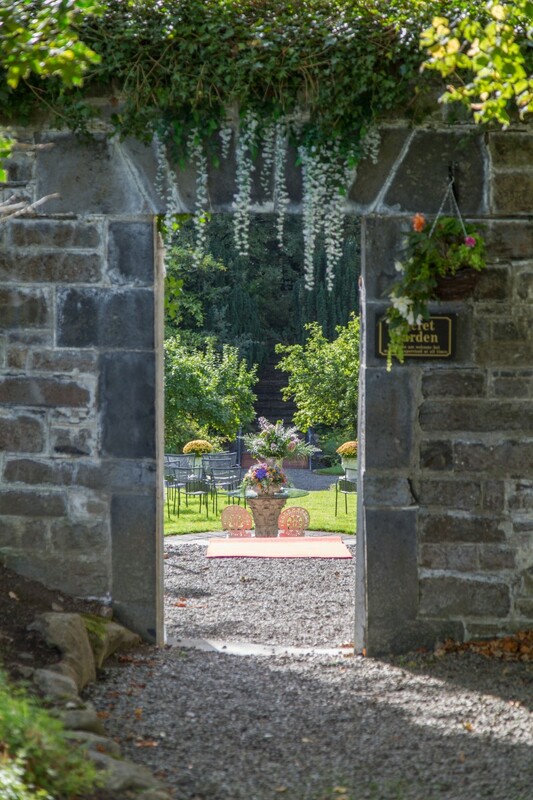 We wanted a beautiful but relaxed venue with character, surrounded by nature, where our families could come together for dinner and relax the night before our wedding, accommodation for most of our guests on site, a beautiful outdoor ceremony venue (and an indoor plan B), good food, value for money, close to Dublin and hassle free organisation. This proved to be a tall order upon viewing the usual venues. No one could give us everything that we were looking for and the inflexibility was surprising and disappointing considering the prices most places were charging. But then we came across Boyne Hill House and we honestly could not believe our luck. From the moment we visited we were put at ease and made feel extremely relaxed and at home. Everything we asked about was met with positivity, nothing was too much trouble. We really felt that the whole team would bend over backwards to ensure that we had everything we wished for and we were right. BHH were an absolute pleasure to deal with in every regard. They took the responsibility of looking after us and our family and friends very seriously and their professionalism was evident in every aspect of our couple of days with them. Our guests could not speak more highly of each member of the team. From respectively looking after my 90 year old aunt and ensuring she was OK throughout the weekend to discreetly and covertly swapping a gin cocktail to a non-alcoholic cocktail into the hand of my mother in law who they knew did not drink. Their level of care was so touching. We were treated so well over the weekend by BHH and made feel really special. Our family and ourselves had a fabulous weekend and a beautiful wedding and could not have asked for anything more. I can wholeheartedly give BHH 5 out of 5 stars, if I could give more I would as I truly felt they gave us 110% in everything they did for us. 5 out of 5 does not do Boyne Hill House justice. I would have no hesitation in recommending Boyne Hill House, it was the perfect venue, the staff are absolutely brilliant, nothing was too much for them. They were so professional in all that they did, even down to the Gardener cutting the grass prior to a fun football match played by many sore heads on Sunday morning. It was a great wedding and mainly due to the professionalism of all. Thank You.Bernard. We had our wedding at Boyne hill house estate last summer. 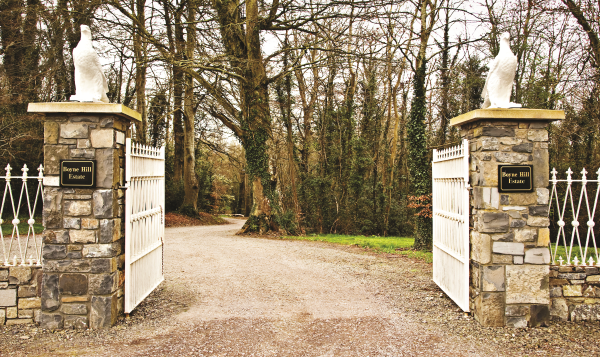 When we went to view locations for our big day, we knew we wanted somewhere “different” and from the moment we seen Boyne hill estate, we knew it was perfect for us. It was an amazing day from start to finish. We had a secret garden ceremony. The pictures were just beautiful in the garden. The food was outstanding and all the guests are still talking about the burgers and chips in the evening, which went down a treat. Leone was brilliant in helping us with our planning and was always so responsive to any emails. We would highly recommend this venue to anyone looking for somewhere unique for their special day. Absolutely 5 star service...completely faultless through the whole build up and day of. Myles and Leone in particular are fantastic. Such a beautiful venue, I could go on and on about why any bride should book this unique and stunning location. Thanks again for this Fabulous review , we hope to have you back soon :) best wishes from all the team at Boyne Hill House. Thanks again for your kind words :) It really was a pleasure to host your wedding . Be sure to pop by soon , all the best from all the team at Boyne Hill House. Boyne Hill House is the most amazing venue for a wedding. It was absolutely perfect for the size of our wedding which was 75/80 guests. But it is not just the venue; it was the staff. They are so friendly and so helpful. The beauty of Boyne Hill House is that the staff are always on hand without feeling that they are on top of you. Special thanks must go to Caroline, Myles and Kenny who couldn't do enough for us. The old house, which has 8 rooms and would typically be used by the wedding party is fantastic and so beautiful as are the entire grounds of the venue. Any of our guests who stayed in the on-site apartments were highly impressed - they were extremely comfortable and had all the necessary facilities. We were very lucky on the day of our wedding that we could get married outside in the 'Secret Garden' which is just so picturesque. But the venue also has great facilities for an inside ceremony. The dining area is just so lovely - it's not too big but not too small - you get the feeling that all your guests are within arm's reach of you. We cannot say enough about the food and the service. It was simply incredible. In addition to the dinner there was the midnight feast which went down really well with everybody. We also stayed a second day/night where we had a barbecue and again the food was just so nice. 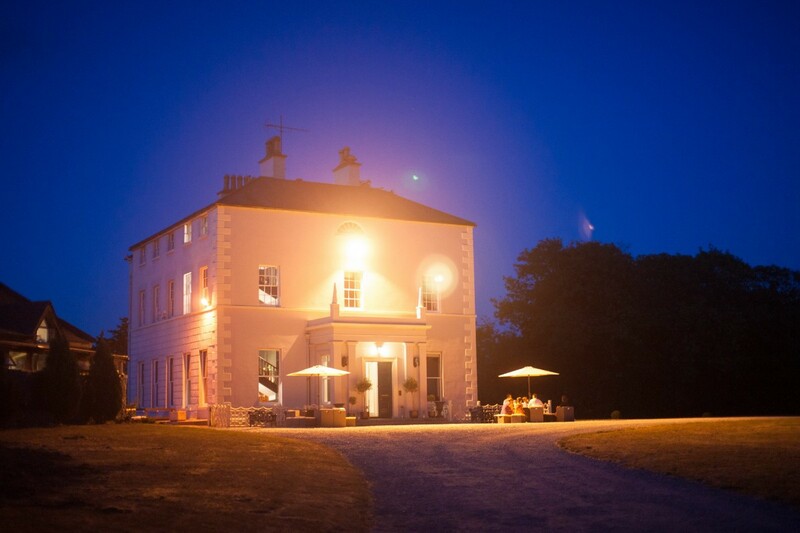 We would highly recommend the second night to anyone who is considering having their wedding in Boyne Hill House. Overall this venue was faultless and we cannot praise Boyne Hill House enough for making our wedding day the most fantastic day ever. Thank you guys for this super review :) We are delighted you both thoroughly enjoyed yourselves. 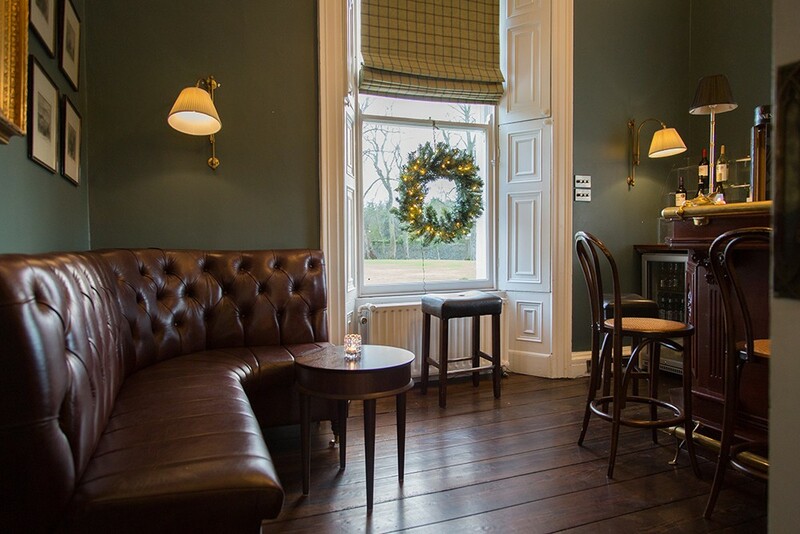 Feel free to drop by anytime to say hello :) Best wishes , All the team at the Boyne Hill House. We are delighted you both had such a fabulous day :) We thoroughly enjoyed hosting your wedding and we look forward to seeing you again soon. A very Merry Christmas , from all the team at Boyne Hill House. Hi Hope :) Thank you for a super review , we love to hear from all our couples!! We hope to see you soon :) Best wishes , All the team at the Boyne Hill House. Yvonne , again many thanks for this fabulous review :) Best wishes,All the team at the Boyne Hill House. Boyne Hill house was the first and last wedding venue we viewed. We knew Boyne Hill was right for us within five minutes of Caroline showing us around. In the months leading to the wedding the staff couldn't do enough for us. When I put on my wedding dress on August 5th I thought I looked like a princess and when I got to Boyne Hill House I was made feel like one. The food was incredible. Our guests are still raving about it. We had fillet steak cooked to order as one of our options and each one was cooked to perfection. We were blessed with the weather which meant we used the courtyard for pre-reception drinks. We made great used of the beautiful Secret Garden too for our wedding photos. Many of our guests also enjoyed a walk around the grounds after dinner. Our day really couldn't have went any better and we truly appreciate everything that Caroline and her team did for us. Emma , thank you for your kind words :) we love to hear from you be sure to pop by soon .. Best wishes, All the team at the Boyne Hill House. You guys rock!! Cheers from Australia mates!! Boyne Hill House is an extraordinary venue but what truly makes it amazing is the people Caroline and her crew could not seriously have done anything extra, our day was perfect!! From the chefs transformation of a dropped cake (thanks dad!! Top job chief) to making my out door ceremony happen on a day that threatened to rain. Thanks to Catherine for making bookings easy, Shano my honorary Ozzy getting us what ever it was we wanted, Miles because I truly had no idea lucky you sorted us out, Ralph my man working round the clock, legend! To all the staff I'm sorry I didn't get all your names but your all magicians we made a mess and it just magically disappears. Thanks for your awesome skills Caroline planning a wedding from Australia was a cup cake when you were driving, everyone said it was the best day ever!! Cannot fault Boyne Hill in any way! From the second we drove through the gates for the first time we were treated like royalty. The estate is so beautiful. Gardens are fantastic and all buildings really well maintained. Staff are wonderful, nothing was too much trouble. We've had so many compliments on our choice of venue! Thank for this great review :) fabulous feedback is always welcomed !! We are delighted to announce that we are apart of Weddings Online Awards 2017. If you had a moment please click link below to vote , greatly appreciated . Click Number 11 for Exclusive Venues https://www.surveymonkey.com/r/wolawards2017 Best wishes , All the team at the Boyne Hill House. A flawless venue and service with staff that could not have been more helpful –making ours & our family, friends stay at the estate an absolute joy. Beautiful place to get married wouldnt have changed the venue for the world. The day flowed beautifully, thanks to Caroline and her team. All so friendly and helpful. They spend so much time on you getting it right, even provide food for almost every meeting we attended, and a taster night, and invited us to stay for a night out that they put on before your wedding with all brides and grooms for that season! The place is so homely, bedroom are beautiful, the conservatory is a lovely alternative to formal round evening tables in a function room for the band..its more like a classy bar setting! Food, i couldnt commend more, they gave us everything that we ask for and then some! This place is most definately worth viewing. Hi Laura , fabulous review :) Great to hear that we convey just how important weddings are to us at Boyne Hill House..We are delighted to announce that we are apart of Weddings Online Awards 2017. If you had a moment please click link below to vote , greatly appreciated . Click Number 11 for Exclusive Venues https://www.surveymonkey.com/r/wolawards2017 Best wishes , All the team at the Boyne Hill House. Amazing venue. Staff very helpful. Made the day go smoothly. Margarete , many thanks for taking time out to give us a review :) We are delighted to announce that we are apart of Weddings Online Awards 2017. If you had a moment please click link below to vote , greatly appreciated . Click Number 11 for Exclusive Venues https://www.surveymonkey.com/r/wolawards2017 Best wishes , All the team at the Boyne Hill House. We can’t thank you enough for the amazing, wonderful day that you made so special for us. The minute I visited Boyne Hill way back in 2013 I knew it was going to be fantastic but you really surpassed all my expectations and made the day out of this world!! There are honestly no words to describe how we felt that day. The dedication and personal service that you showed us was outstanding. Just to say that the small little things that you did for us did not go unnoticed! Your kindness and thoughtfulness really made the day the best of our lives! Telling you that you’re “appreciated” does not do you justice! You’re the best! Thank you from the bottom of our hearts for all that you did for us leading up to and on our wedding day! Every time we came into contact with any one of the staff in Boyne Hill we were so impressed with their professional, easy attitude. The staff were very much committed to make our day personal and tailored to our dreams! In fact the day was beyond our dreams! Our guests still rave about how well they were looked after and that our wedding was the best wedding they have ever been to! This is down to the amazing team in Boyne Hill! Hi Suzanne and Eoghann , you were both a pleasure and we loved working with you to make your day that extra magical.. Be sure to come by soon for a visit :)We are delighted to announce that we are apart of Weddings Online Awards 2017. If you had a moment please click link below to vote , greatly appreciated . Click Number 11 for Exclusive Venues https://www.surveymonkey.com/r/wolawards2017 Best wishes , All the team at the Boyne Hill House. Hi Caron and Brian, reviews like this makes what we do all the better we are delighted you were so pleased :)We are elated with happiness to announce that we are apart of Weddings Online Awards 2017. If you had a moment please click link below to vote , greatly appreciated . Click Number 11 for Exclusive Venues https://www.surveymonkey.com/r/wolawards2017 Best wishes , All the team at the Boyne Hill House. Everyone from Managerial to bar staff where amazing! They couldn't do enough for us. Boyne Hill Estate was an an amazing place and the food was fantastic. Would highly recommend to any considering to get married here to go and look at it. we loved every second of our day in Boyne Hill. each member of staff were so great to deal with and nothing was a problem. the place itself is just what we were looking for, cosy, homely &all to ourselves. the food was great, especially the starters, everyone loved the picnic starter & the steaks were cooked perfectly, despite there being almost an hour of a delay due to a medical emergency with one of our guests, which the staff handled so well. really hope someone I know gets married here soon so that we can go back and enjoy the day as guests! Thank for such a fabulous review.. You are more than welcome to come by anytime , even just for a pot of tea :) Best wishes ,All the team at the Boyne Hill House. A unique and wonderful wedding venue with an attentive and flexible staff that went above and beyond to make our day perfect. Could not recommend Boyne Hill House highly enough! Perfect, beautiful venue. Excellent staff and management. Could not fault a single aspect of service ???? Great to hear Mary , thank you for taking the time to give a review :) We are delighted to announce that we are apart of Weddings Online Awards 2017. If you had a moment please click link below to vote , greatly appreciated . Click Number 11 for Exclusive Venues https://www.surveymonkey.com/r/wolawards2017 Best wishes , All the team at the Boyne Hill House. Fantastic staff in a superb venue. Perfect for a cosy winter venue. Guests are still raving about the food! Great to hear Louise , thank you for your kind words :) Drop by soon. We are delighted to announce that we are apart of Weddings Online Awards 2017. If you had a moment please click link below to vote , greatly appreciated . Click Number 11 for Exclusive Venues https://www.surveymonkey.com/r/wolawards2017 Best wishes , All the team at the Boyne Hill House. Amazing venue, fantastic staff, great food. From start to finish we were in love with the venue. The staff took any ideas we had and made them more beautiful and made everything happen with ease. I wasn't one bit stressed or overwhelmed. They gave us lots of options and ideas that felt unique and suited what we wanted perfectly. People still tell me how unique and wonderful our day was.Looking back at the pictures of the stunning grounds, secret garden and the beautiful House and courtyard, the pictures look as magical as it felt.We will never forget it. Caroline and the team at Boyne Hill House were truly amazing when we got married over 3 yrs ago. I just received a request to submit a review. We had an amazing day, our friends and family still comment on the great day we had. Having sole use of the venue for your special day is a huge positive. At the time I had heard about Boyne Hill House and after a phone conversation with Caroline I knew the venue was what I was looking for. Within minutes of arriving at the venue to check it out I knew it would be perfect. Nothing was too much trouble for the staff to help with. Caroline was also extremely helpful in helping me confirm a civil ceremony, on the day but I believe this whole process has become less complex in the last few years. Super day had by all. We found Boyne Hill House staff lovely to deal with, we had an amazing day and really couldn't fault their attentive service. Boyne Hill House are THE most amazing wedding venue!! The venue itself is absolutely beautiful and the staff are truly brilliant. They will do anything and everything for you. I would highly recommend the is wedding venue to anyone wanting a truly magical day. Extremely helpful and accommodating staff. Nothing was too much trouble. Caroline agreed to every daft idea we asked for. Even allowing my dog to come along for the photos. It was a wonderful relaxing day. Wonderful people, beautiful venue, family and guests still talk about the day it was just perfect! 5 years later, we still remember Boyne Hill House so fondly. They made everything just wonderful and so special. We never felt like our wedding was like others we'd been to, it was uniquely ours and so much of that was because of the beautiful venue and highly professional staff. Thanks again everyone! We are just home and can't believe it has almost been a month since our fabulous wedding in Boyne hill. I didn't cry for the duration of our wedding but when it came to leaving on Sunday afternoon the tears were flowing, I just did not want it to end. From the minute we drove up the avenue in early 2012 we just knew this was the place for us. We wanted different and we got it and much much more. Caroline, Katie and Michael, you go above and beyond the call of duty and nothing was ever a hassle. You always made us and our families feel so welcome to the point where you couldn't get rid of us at times!!! To all the catering staff, the food was exceptional and everyone is still talking about how different it was, truly fabulous. To Olivia my saving grace, when my dress was getting in the way on the dance floor she appeared with her needle and thread to sow it up so I could dance the night away,thank you. The BBQ the following day was the ice ing on the cake, it was so nice to spend quality time with our guests and take everything in. Our entire wedding experience in Boyne hill was a dream, no stress and very relaxed and this is something you feel the minute you walk in the door. But it wouldn't be possible without such wonderful dedicated staff. We are truly great to you all for making our day so special. Where do I start with this testimonial. We got married in Boyne Hill house on the 16th Feb. I cannot tell you how much we loved this venue right from the start, it was more than I could have ever dreamed for. I am even getting emotional typing this up thinking of our day we had there. Caroline, Michael, David and Katie you really helped to make our day so special, especially you Michael dealing with all my mad requests. The excellent service you all provided was something all our family and guests mentioned on the day. When we went around to speak to our guests after the meal almost every table mentioned that the food was above any standard they have had at a wedding before. The chunky chips were my idea and they went down a treat! We have some amazing photographs of the house, the grounds and the secret garden so special thanks to our photographer Pawel Bebenca. Cannot thank you all enough. Thank you does not seem like a big enough word to show our gratitude to all at Boyne Hill House. In particular we would like to thank David, the barman, who is possibly the best in the world!! He was so helpful and friendly and a great laugh. Anne who was running around after us in the Mansion House, could not have been more helpful. She was always there when we needed her. Ron was a very calming influence on me throughout the whole weekend. Whenever I was in tizzy about something, he was there pointing out that there was no need to stress and he was right. Olivia was also a brilliant person to have around. So helpful and friendly and made sure everything was done just right.Caroline, Katie and Michael……what can I say….what an ‘A’ Team. You guys are the best!! Michael we didn't meet you until after we had booked Boyne Hill but once we had, I felt you understood me and what I wanted the wedding to be like and you helped create this. You were also a very calming influence if I got worried about things, like when I thought I didn't have a throwing bouquet and you calmly told me it was waiting for me behind the bar. Thank you for this and everything. Katie, you are the reason we booked Boyne Hill House in the first place. After meeting you at the wedding fair, we booked an appointment come and view the place. The tour you gave us was fantastic and the image you put in our minds of how the whole weekend could go was inspiring. You painted a picture of perfection that made us very excited. From that moment we were sold and every time we brought people see it (of which there were many), we always asked for you to do the tour and you always delivered. Caroline, my tears as we said goodbye should say it all. I couldn't have asked for a better person to be in charge of our wedding reception. You had absolutely everything under control from the word go. You put up with my many, many, many questions and always knew the answer. I put my trust in you and it definitely paid off.You, Katie and Michael were always there when I wanted to visit, ask a question or needed reassurance. I have named some staff members as I dealt with them on a one to one basis but this does not take away in any way from all the other staff, both in the mansion house and the courtyard. You all contributed to our perfect day and for this we are truly grateful. I received so many comments from the guests about how incredibly helpful and friendly the staff were. Nothing at all was too much trouble for you. You all helped to create some magical memories over the weekend that we will remember forever!! Somebody told me not to expect perfection, that it doesn't happen, that something always goes wrong. Well I did expect perfection and that is most definitely what we got. The whole weekend ran smoothly from the moment we arrived on Thursday till when we left on Sunday. (Even the weather) Thank you all so much for that.People are still (3 months later) telling us that it was the best wedding that they have ever been to!! Katie that picture you painted in our heads all the way back in January 2011, was the reason we booked and the reality of what we got was so much more than that. We cannot thank you all enough for everything you did for us, so once again THANK YOU!! Means so much to get such a fantastic review :) Thank you for letting us be apart of your Fabulous day !! We were looking for something a bit ‘different' for our July 2012 wedding. Our criteria included a venue that would be reflective of our personalities and lend itself to a relaxed, cosy and personal wedding. We honestly thought that, to find a venue, we would have to compromise on some aspects. Thankfully we found Boyne Hill House. We first visited Boyne Hill House back in February 2011, before they had had their first wedding. We immediately fell in love with the venue. We knew straight away that Caroline and her team would not settle for anything short of perfect and we were certainly not disappointed in the months that followed. Every time we visited Boyne Hill House we were met with utter professionalism accompanied by a personal, welcome feeling. The biggest appeal of Boyne Hill House, for us, was that it was informal yet elegant. Our families took the Mansion House for the three nights of the wedding weekend. Having the stunning house all to ourselves was such a treat and it became a home away from home for us. The Mansion House staff were so lovely, attentive and helpful. The wedding day went perfectly and Caroline, Katie, Michael and the rest of the staff were on hand to carry out our every request, regardless of how big or small it was. Katie , with some extra help and a ladder, even looked after the paper pom poms I had and managed to decorate the driveway on the morning of the wedding. The function room looked stunning. As one guest remarked, it was ‘like something from a magazine'. The food went down a treat, the starter and the bacon butties later in the night proving to be a big talking point. Moving downstairs for the dancing was a big hit with both young and old. We had been a little concerned about the size of the dance floor but it worked out great. We spotted people dancing that would definitely not be seen on a bigger dance floor at a wedding. We would not even hesitate in recommending Boyne Hill House to anyone. 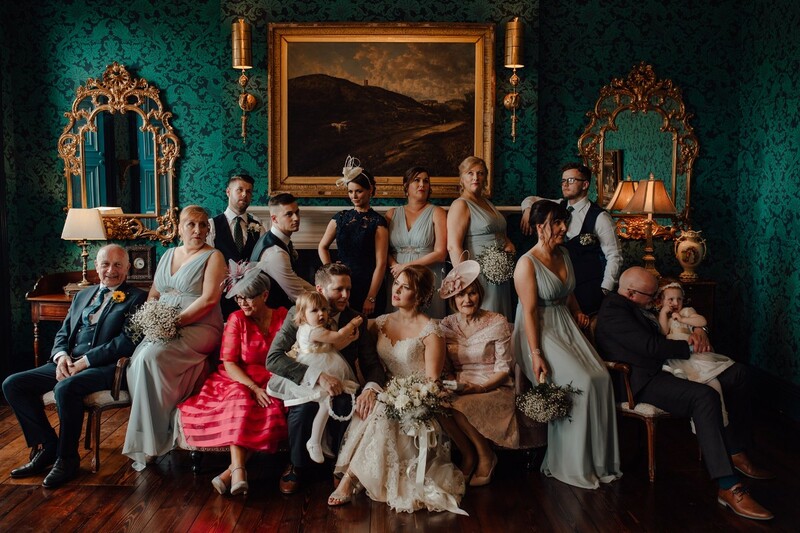 We have such beautiful photographs and memories of our day and Boyne Hill House played a major part in giving us the most amazing day of our lives. We can't thank Caroline and her team enough. Guys , what an amazing review !!! It was an absolue pleasure to host your wedding and all the better when we know our couples thoroughly enjoyed themselves..All the best from all the team at Boyne Hill House. Just saying Thank-you doesn’t seem to cover what Caroline and the team at Boyne Hill House did for us on our big day. We couldn’t have asked for anything else from them, from the moment we met Caroline and entered Boyne Hill House our wedding plans fell into place. We wanted a venue that reflected our personal style as well as catering for our guests, many of which were travelling from the UK. The exclusivity of the venue was perfect and the setting gave me a little part of home on my big day. To say I was a demanding bride would be a little harsh but I definitely knew what I wanted and Caroline, Katie, Michael and their team were very supportive of ideas and flexible to say the least – setting up breakfast downstairs on the day of the wedding and allowing me to set up a projector and karaoke machine. When we look back on the day it is the attention to detail that really stays with you. The knowledge that very thing was organised and all angles were covered gave a calm and relaxing atmosphere to the day which was echoed by the whole staff. Our guests were amazed by the venue upon arrival and then continued to be ‘wowed’ by the venue throughout the whole day, with amazing food that is still talked about today, and catered for everybody’s needs, nothing seemed too small a request. We are firm believers in people making a venue, not the place itself but with Boyne Hill house you get the best of both. The most amazing venue with the most amazing staff. They were a joy to work with and we are only sorry we can’t keep seeing and working with them now the wedding is over. We are delighted you both enjoyed Boyne Hill Estate :) Thank you for taking the time to give such a fabulous review!! All the best from the team at Boyne Hill House. "Myself and John got married in Boyne Hill House in August 2011 and really it was better than I could have imagined. We were looking for a venue within an hour of Dublin, somewhere that most quests could stay over, not a hotel, somewhere with fabulous grounds, somewhere that didn’t break the bank, and exclusivity!!! Needless to say we didn’t expect to find all of that, but really Boyne Hill had it all and more. The staff were honestly the friendliest and most accommodating people I have come across. Caroline, Tia, Katie and Owen were just superb; they let me have the run of the place to decorate as I chose, which meant we could put our own stamp on the place. We were blessed with the day and had our drinks reception in the secret garden, John was a bit worried about the lads nipping into the bar, so we had bottles of beer in ice buckets along with the champagne, it worked a treat. The photographer was spoilt for choice; we got great pics in the orchard, by the Boyne and in the old house. We had the band downstairs, as we didn’t want to split up the crowd too much with smokers, I was a little worried that the dance floor was too small, but it worked out perfect. Everybody loved it so much my cousin is getting married there next year!! If you looking for a relaxed, elegant place to have a great wedding (party) this is it!! Thanks again to all the staff who made myself and Johns life so much easier, especially Tia who helped take all the candles and decorations down the next day!!" Hi Marianne & John , thank you for such a fantastic review !! It means everything to our team to ensure every couple leaves with such fond everlasting memories ..All the best from the team at Boyne Hill House. Having had our wedding in Boyne hill House Estate I just wanted to try & put in words our experience for other happy, newly engaged couples looking for the perfect venue!! Boyne hill is just amazing everything was truly perfect right from the off. The views, the grounds, the house & the venue itself are stunning. I feel the pictures don't do it justice & this venue has to be seen. The staff couldn't have been more obliging. We were their first wedding & I honestly can tell you they set a terribly high bar for themselves as it ran so smoothly that I would not change a thing and each wedding will only surpass the previous one! I was very anxious as to how it would go-but WOW what a venue & what a wedding!! On the day the team were so helpful, courteous & polite to our guests that everyone felt it was their home for the day. My best memory is Caroline coming to me halfway through the day asking me "Is there anything I can do for you? It is your day & you should feel like a princess." They were so calm& collected & continually wanted to help us& have the exact wedding we wanted. I cant thank Caroline & her team enough for such a fantastic day. We really had the best day of our lives. Hi Ronan & Thérése , many thanks for giving such an amazing review:) Great to hear , Our team conveyed just how special and unique your wedding meant to us .. Pop by anytime , all the best from all the team at Boyne Hill House. To all the staff at Boyne Hill House: Just a note to thank you so much for everything on the lead up to and during our wedding in Boyne Hill House in July. The venue is absolutely stunning and we got some amazing photos in the secret garden and the house itself. We knew on our first visited that we couldn't have our wedding anywhere else. Being a new venue, we were a little anxious but we needn't have been. Every detail was taken care of and the décor was stunning, I was able to relax and enjoy the entire day and night. Caroline and Katie were superb from the outset; friendly, extremely professional and very well organised. The food was second to none and our guests are still talking about it and will be for some time. Our heartfelt thanks and good luck for the future! It was our pleasure to host your Wedding and we are delighted you really enjoyed it.. Be sure to pop in sometime :)all the best from all the team at Boyne Hill House. Hi Caroline and Michael, Tony and I wish to thank you for helping to make Sinead and James' wedding day a most joyful and memorable occasion. To quote a number of guests, the setting was "stunning". We loved it from the first time we came to look around and having visited for one reason or another in all four seasons we would reccomend it highly to anyone. The service was brilliant! Each time we visited,emailed or phoned, you and the rest of the staff were warm, friendly and efficient.No query/request was too much trouble.On the weekend itself you both looked after us so well. Although we were not there,(busy entertaining and keeping calm one bride and three bridesmaids) ,everyone has commented on the roaring success it was.We will never forget Saturday 9th of February 2013.!---- A warm welcome for all guests,delicious and plentiful food, all beautifully presented. We particularly enjoyed the ceremomy with which the main course was delivered and also the presentation of the 'sweet' course. We especially want to say thank you to Michael for Sunday, particularly Sunday evening when we enjoyed the 'Big House' to the full. It was so comfortable and accommodating that all the young people cancelled going out and stayed in with us and a great time was had by all. Finally please pass on our thanks to all your colleagues who helped to make the weekend such a happy occasion. Michael, Catherine, Olivia, Ron and all the staff at Boyne Hill, Sorry its been awhile coming but we want to thank you all for everything you did for us to make our Wedding day so special. We had an amazing experience for our wedding and we have no doubt that this was down to the wonderful staff at Boyne Hill. Thank you for your help over the 6 months leading to the wedding and your patience in dealing with every request. Michael, i can’t thank you enough, i don’t know how you put up with all my questions and lists on the run up! Every time we visited we just became more convinced we couldnt have selected a better venue! Boyne was the perfect location for us, the setting was exactly what we wanted, it was so intimate it allowed us to really create the wedding we wanted. The mansion house is stunning as are the grounds and the set up was ideal for us. From the time we arrived the day before the wedding everyone relaxed immediately and this was all down to the place itself and your team. On the morning of the wedding there were no hitches despite us both being in the same house and this was really helped by the staff particularly Ron and Katie who kept everything running smoothly. The day of the wedding went without a hitch, all of our guests have not stopped raving about how great a location it was. Even our wedding band, who are very experienced, could not get over how great the set up was and how much everyone enjoyed themselves. For us as well as the location it really came down to the staff and they were all amazing. Everyone was so happy to help and bent over backwards to make sure all of our guests were comfortable and had everything they need. A big thanks to all the waiting staff, the boys behind the bar and to Caroline at reception. No one at the wedding had been to Boyne House before and they couldn’t get over the five star treatment! A special thanks to Olivia who saved the day with her sewing skills. The food is also in need of a mention as it was truly lovely, coming from a family of foodies it was essential that this went right. It was exceptional over the whole weekend, everyone was delighted including the Vegan! I have to also mention the exquisite desserts which went down a treat with everyone. The next afternoon bbq was also delicious and the chef’s attention to detail in every aspect was absolutely great and noticed by all. All of this contributed to make our wedding day more perfect than we could have imagined, the only sad bit is that now its over! We really hope to be back one day at another wedding where no doubt the bride and groom will be just as thrilled and happy as we were on the day. Thanks again for everything, our day was truly magical and we have no doubt that Boyne Hill House and all the staff were a big factor in it being such a success. Many thanks for such a fabulous review :) Pop by anytime , all the best from all the team at Boyne Hill House. 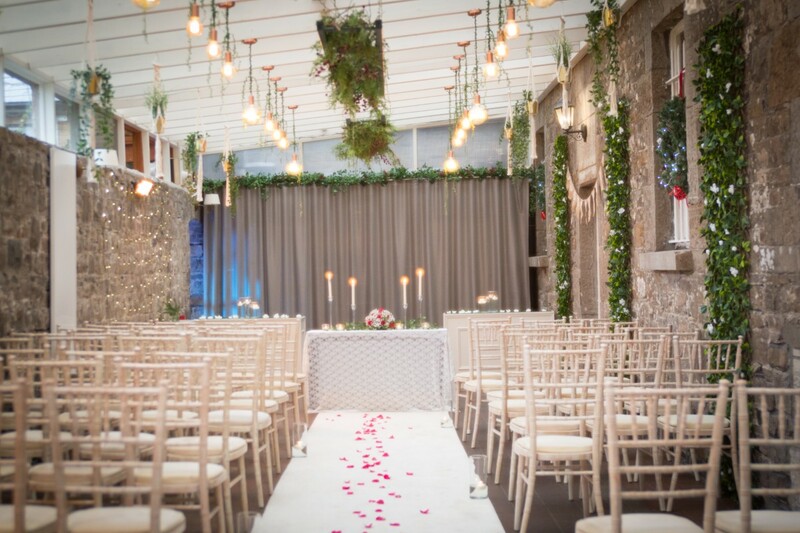 These 8 Couples found their Perfect Irish Wedding Venue - Find out how!